Many people don’t give standing any credit, as they simply aren’t aware of just how beneficial to their bodies simply standing upright for some time can be. The truth is that standing helps to keep the musculoskeletal system healthy by reducing stress on your soft tissue, back, ligaments and joints. It also prolongs the life of all aforementioned body parts. People usually avoid standing and prefer sitting, which is fine, but constant sitting for hours on end tends to have negative side effects. The best thing to do is to be mindful of how much you sit and stand, and try to find a balance between the two. If you didn’t know, there are many ways to stand more during your day, including standing desks. 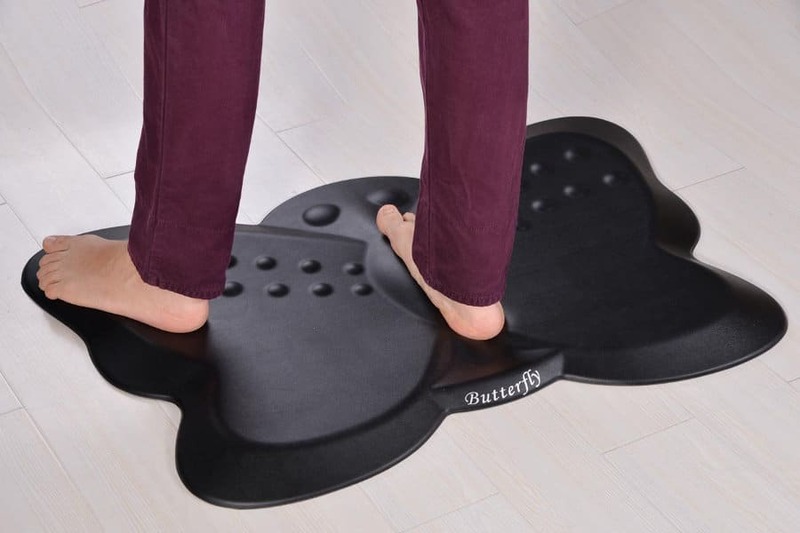 Anti-fatigue mats are almost a given if you spend long hours on your feet. 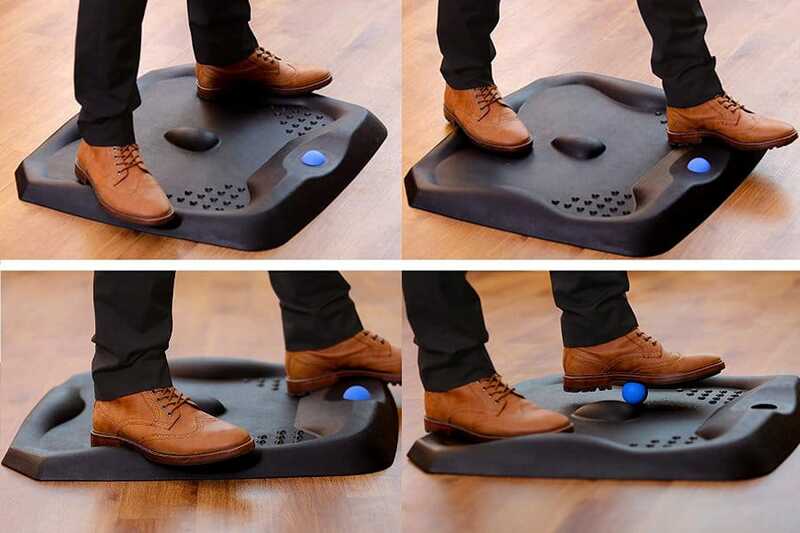 There are many ways to help reduce back pain in the office, and we think the anti-fatigue mat is one of them. 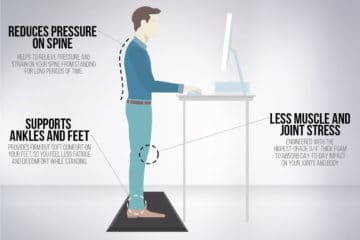 If you have recently transitioned to using a standing desk, or you stand stationary at work often, you’ll know that it can be a killer after long periods of time. Sore knees, sore back, sore ankles, and sore feet. Standing on hardwood, concrete, or even some carpet just doesn’t have the give and cushion required to protect your muscles and joints, and can lead to common office injuries such as “office knee”. Standing for long periods not only causes pain in the feet, legs and back, but also in studies it is shown that it can cause stiffness in the neck and shoulders. You might think: well it’s soft and cushiony, that’s how it works! In a way, yes, but that’s only half of the equation. In fact, the real answer is instability. Now, this sounds like it’s a little bit backward, so we’ll try to explain it a little bit better. Essentially, when you are standing on hard ground it puts a lot of pressure on your muscles, joints, and veins. This is accentuated by the fact that you will be completely still and immobile. Often you will lock our your knees, hips, and ankles to take some strain off of your muscles, but this will be worse in the long run. By being a soft surface, not only is your weight distributed through the mat a bit better, but the mat itself means that you will never actually be still. Although you may not feel it, your body will constantly be balancing and adjusting to the instability in the foam, forcing your muscles to make micro-adjustments as well. It is this that stops you from getting sore, tired, and losing concentration. We’ve compared and contrasted a bunch of different products for you. 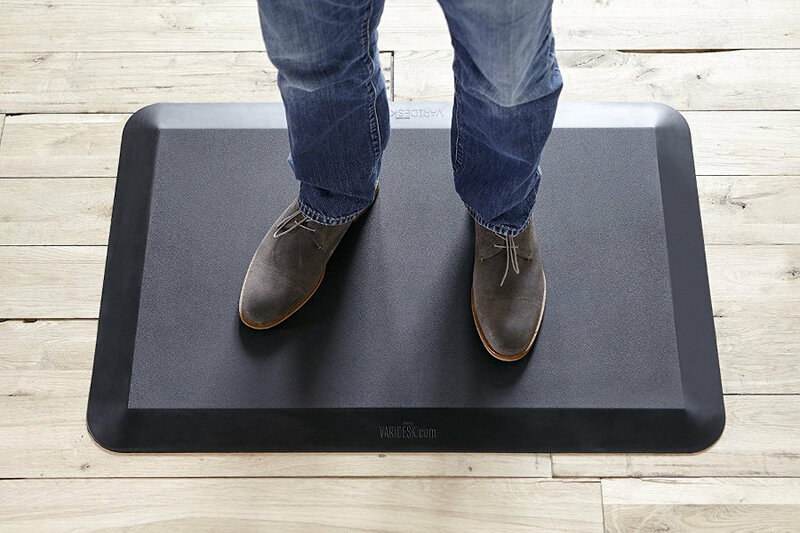 Take a look at what we think are the best standing desk anti-fatigue mats on the market. These mats are your bread and butter, absolute basic (but not too basic!) style to get you started. If you don’t know what you’re looking for then this is a good fallback. This style of mat is usually 0.5 – 1 inch thick, made from dense foam, and completely flat all over. Its primary purpose is what we mentioned above: providing cushion and minor instability. The non-flat active mats were a newer style of standing desk mat to arise. The mats come in a variety of shapes and forms, but all have the same purpose: creating an even more active working stance. These non-flat mats have a variety of ridges, bumps, and rises for you to put your feet which enable you to twist and stretch your legs. Not only does it enable you, it actually encourages you to do so. Standing on one of these mats will get you moving and stretching, improving blood circulation and making your muscles and joints more limber. This style of standing desk mat is much less common, yet there are a few products out there that we would recommend. These mats usually involve something other than the mat to provide the necessary activity. For example, there are mats with massage balls inside a groove or mats with rocking mechanisms to rest and swing your legs on. The more you move while standing, the better you will feel after longer periods of time. These full active mats promote more activity and movement. Now you know all the main benefits of a standing desk mat, we can take a look at what factors you should consider when buying one. If you are going to use the anti-fatigue mat with a standing desk, you should consider how often you are going to move from seated to standing. Many people who use a sit-to-stand desk will change positions multiple times a day. A flat standing desk mat may be able to fit beneath your desk chair, but it is not ideal. 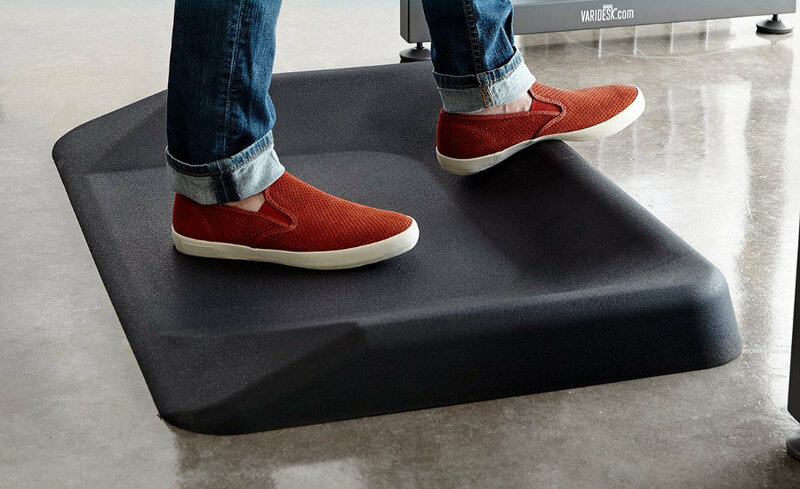 The other styles of mat definitely can’t fit under your chair so if you”re going to be changing from sitting to standing all day long, you’ll also have to move the mat, so make sure to choose one which is smaller and lighter. As we just mentioned, the size of the mat becomes an issue if you constantly have to move it during the day. Also, take into consideration the size of your desk. Although most desk will easily fit a mat beneath them, there are some mats which are taller and wider than usual, and these may not fit so easily. Another size factor is the thickness of the mat. The general rule is the thicker the better, although you don’t want to be standing on 6 inches of foam either! A standard thickness is generally around 0.5 – 1 inch thick. The thickness of the mat will add more cushion, more’instability’, and therefore more comfort. Most mats these days are made from a dense foam material, so there isn’t too much to choose from in this area. Be aware however that the material used should have two additional qualities: non-slip and cleanability. If you are looking at buying a flat mat, then beveled edges are essential. With active mats, this isn’t so important as the mat already has lumps and bumps, but with a flat mat, you want the mat to be as flush with the floor as possible. Beveled edges not only ensure that the mat doesn’t curl up over time but also it is just much safer than a straight edge. When in the office, you don’t need anything to be a tripping hazard around your desk. As we touched on earlier, the material of the mat needs to be non-slip. This is mainly on the underside of the mat, but could also make an impact on where you stand. When you place the mat on a hardwood, concrete, or even carpeted surface, you want to make sure there is absolutely no movement. A mat that slips is not only annoying for the user, it can be quite dangerous. There is actually a fairly large range of costs when it comes to standing mats. In general, most flat mats cost anywhere between $30 and $60, whereas the active mats can range from $50 to over $100. As always, the most expensive items aren’t ALWAYS the best, but as a rule of thumb, you get what you pay for. Understandably, if you are looking for maximum activity during your day, then you’ll have to pay more for an active mat, but if you just want a bit of extra cushion then a cheaper flat mat will suffice. The durability of the mat is important as there are a number of things that can happen. A man needs to be resistant to things falling on it, as well as general wear and tear. Also, over time the mat might condense and become a bit worn out, so you should be wary of the length of the guarantee in case any of this happens. The last point isn’t so important for office use, but many people also use their mats in the home, most commonly in the kitchen. A mat needs to be washable because there are plenty of products that can damage or stain the mat, and it can be a safe house for bacteria. Most mats can be washed with hot water and detergent, but make sure that this feature is expressly stated by the product you buy. So there you have it! As you can see anti-fatigue desk mats are really a must if you stand for long periods of time or use a standing desk. The added cushion will provide so much extra comfort and will rid you of all the niggly aches and pains that occur during the day. There are a number of different qualities a standing mat can have, but as long as you pay attention to the most important points we listed above, then you’ll be fine. Lastly, the level of activity while you stand is completely up to you, so whether you choose a flat mat or an active mat just depends on how much movement you need. If you’re looking for EVEN MORE movement during the day, have a look at our review of standing desk balance boards by Fluidstance. The team at Painless Movement are dedicated to bringing you the best product reviews, articles, exercises, and more to help you live a healthy, active, and pain-free life. All our articles are the result of many hours of research, comparisons, study, and writing. If you'd like to know more about our research and writing process you can do so here. Our team consists of professional writers and researchers as well as medical experts that help to review and approve every article on PainlessMovement.com. To learn more about our team, please see the About page. We've compiled all the product specifications for over 50 standing desks into an easy-to-use excel file. Want to know what the best desk is for you? Get your FREE DOWNLOAD now by signing up to our newsletter.